The United States is commonly thought of as a low-tax country. But workers effectively pay some of the highest taxes in the developed world — without getting a decent welfare state in return. Comparing labor tax rates across countries is a tricky endeavor. Some countries rely mostly on income and payroll taxes charged to workers, others on payroll taxes charged to employers, and still others on compelling workers and employers to pay private parties who provide pension and health insurance products. To get an apples-to-apples comparison, you have to normalize all of these various schemes into a single labor tax concept that actually reflects just how much labor compensation is being put towards compulsory payments of one sort or another. The OECD produces a number of Taxing Wages publications each year that permit this sort of cross-country comparison. Most of these publications focus on converting formal labor taxes into a standardized format that allows researchers to calculate comparable “labor tax wedges” across the various tax schemes. But formal labor taxes are limited because they omit “non-tax compulsory payments” (NTCPs). NTCPs are payments workers and employers are legally compelled to pay to private parties. NTCPs are no different from taxes except that NTCPs are made to private corporations like health insurance companies rather than to the government. Occasionally the OECD publishes information that combines formal taxes and NTCPs together in order to allow researchers to compare “compulsory payment rates” across countries. The last time they did this was in 2018. The 2018 OECD publication acknowledges that employer health insurance premiums in the United States are NTCPs because they are mandated under Obamacare’s employer and individual mandates. But the publication nevertheless excludes employer health premiums from its US NTCP calculations because the authors say these premiums cannot be modeled to their satisfaction. The apparent reason these mandated premiums are incompatible with the OECD’s Taxing Wages model is that they are open-ended payments: employers and employees have to buy private insurance regardless of its cost. If the mandated premiums were set by law as a fixed sum per worker or percentage of payroll as in other countries, then they could be included in the OECD’s figures. The OECD may not be able to include employer-based health insurance premiums into its model, but I certainly can. And when I add them into the OECD model, I find that the average American worker has one of the highest compulsory payment rates in the developed world. For this analysis, I take the information from the OECD’s Taxing Wages model and combine it with data from the Medical Expenditure Panel Survey (MEPS). The MEPS data shows the average premium for employer insurance, broken down by type of coverage (family or single) and payer (employer or employee). By counting those average premiums as NTCPs, we can compute a compulsory payment rate that is comparable to the compulsory payment rates the OECD produces for other countries. 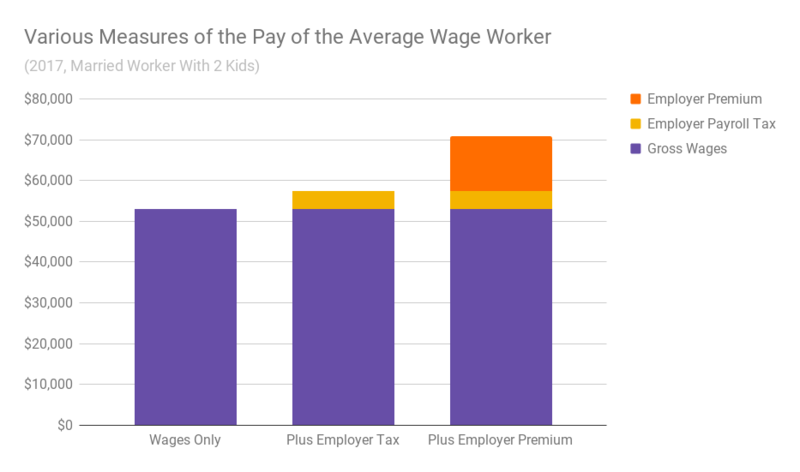 To be clear about what I am doing here, the following graph provides a detailed breakdown of the difference between what we normally think of as “employee taxes” and the OECD concept of “compulsory payments.” This graph is for a married wage-earner with two kids who earns the average wage and has a family insurance plan through their employer. 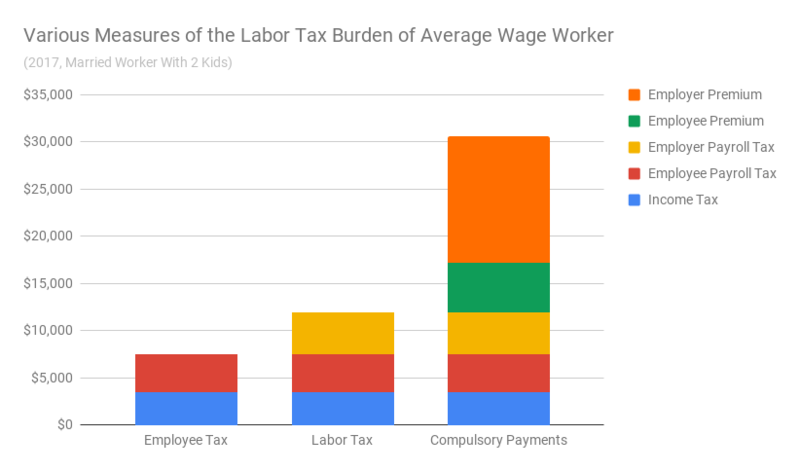 If you are going to count employer-side payroll taxes and employer premium contributions towards the labor tax burden, then you also need to count those things as worker pay. The following graph mirrors the one above except it shows what the average wage really is when you count all of the employer’s labor costs, not just the cash it pays to employees. 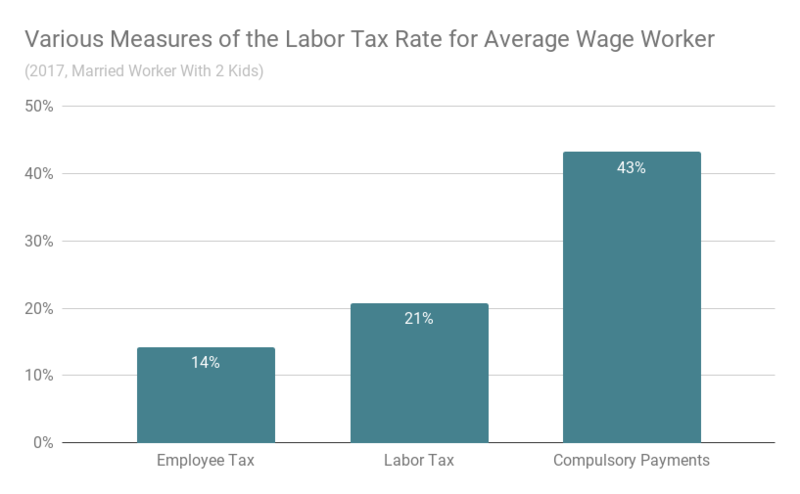 Finally, we can divide each labor tax concept by each pay concept to show the difference between what we often think of as the “employee tax rate” and the actual “compulsory payment rate” (share of labor compensation going to tax and NTCPs). 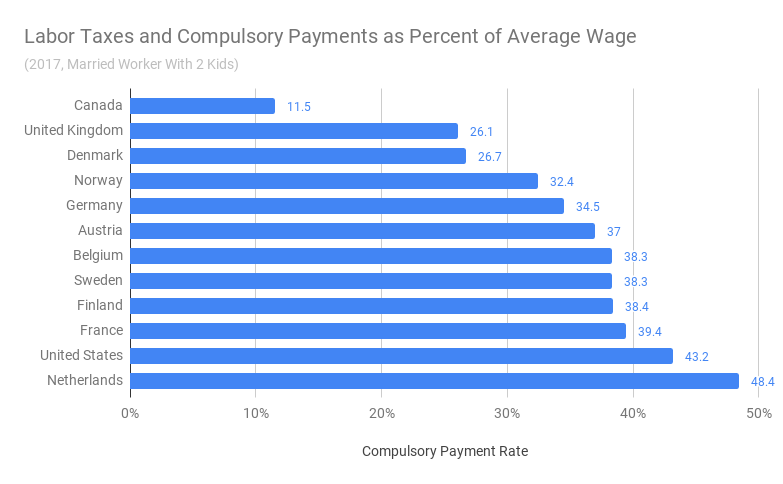 The comprehensive measure shows that a married couple with two kids that makes the average wage pays over 43 percent of their income in compulsory payments of one sort or another. Health premiums are 26.4 of the 43.2 points. Finally, we can go back to the OECD NTCP data and compare the US to other developed countries. When we do that, we find that only the Netherlands — with its compulsory private health insurance and compulsory private pension — has a higher labor tax burden by this measure. Ultimately, this is a long exercise in pointing out the obvious: American workers already pay more than enough money to provide good health care to everyone in the country. It’s just that they pay it into a private insurance system that wastes large portions of it on rents and administrative redundancy. As the Mercatus Center noted last year, by implementing a Medicare for All system, the US could insure 30 million more people, provide dental, vision, and hearing coverage to everyone, and virtually eliminate out-of-pocket expenses, all while saving $2 trillion over the first decade of implementation. Not only are we taxed and not getting any real benefits (not even a decent infrastructure), but we are also taxed without representation. Our so-called representatives, who should be our servants but now think they are our lords and masters, are running a government of the rich, by the rich and for the rich almost exclusively.